The arachnid-infested Manhattan returns on Battleworld this July! Today, Marvel is pleased to present your new look at SPIDER-ISLAND #1 – a double dose of 8-legged madness from two exciting creative teams! First, writer Christos Gage and artist Paco Diaz bring you a domain under siege! The Spider-Queen has won, turning her domain into an island full of Spider-Madness. With Spider-Man defeated, all hope lies in the hands of Flash Thompson – the symbiote wielding hero known as AGENT VENOM! But does he stand a chance? 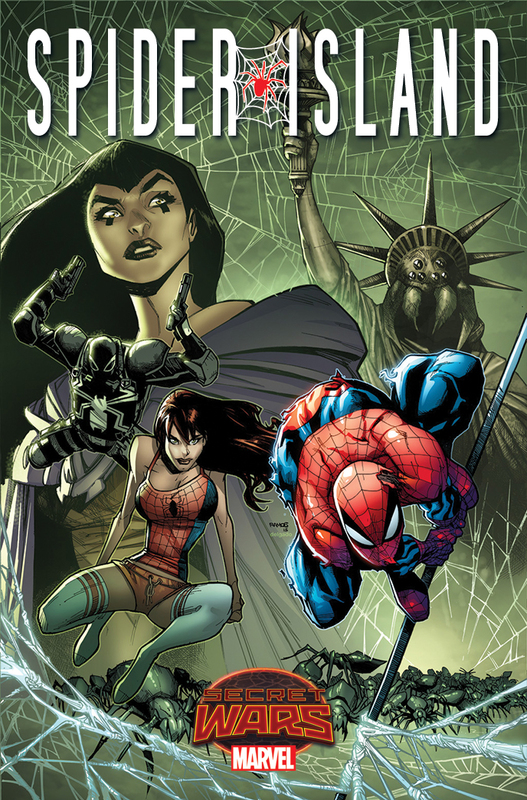 The, return to the fan-favorite MC2 character as Mayday Parker takes center stage in a new story from her original creators – Tom DeFalco, Ron Frenz and Sal Buscema! Now adorning the title of Spider-Woman, does May have what it takes to brave the horrors of Secret Wars? 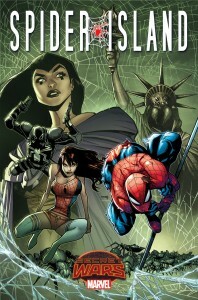 Two action-packed tales of wallcrawling and webslinging await you this July in the can’t-miss SPIDER-ISLAND #1!